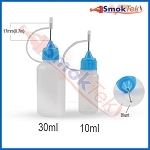 Easily test the resistance of your cartomizers and other atomizers! 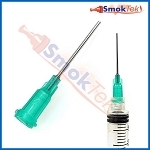 Simply screw on a cartomizer or atomizer, and this tester will show you the resistance in ohms. 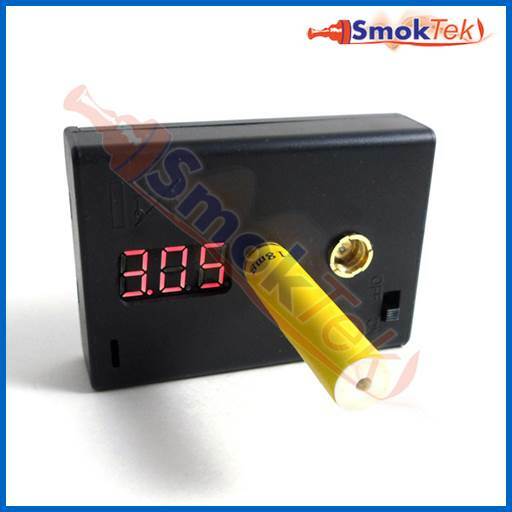 This tester is great for testing ohms or for checking for bad/defective coils. 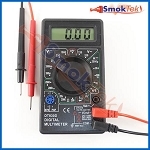 The ohm meter will read from 0.01 to 9.99 ohms and is accurate to +-0.2%. 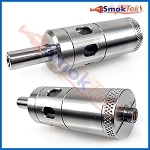 The test amperage is only 3 milliamps and will not produce heat at the coil of the atomizer you are testing. 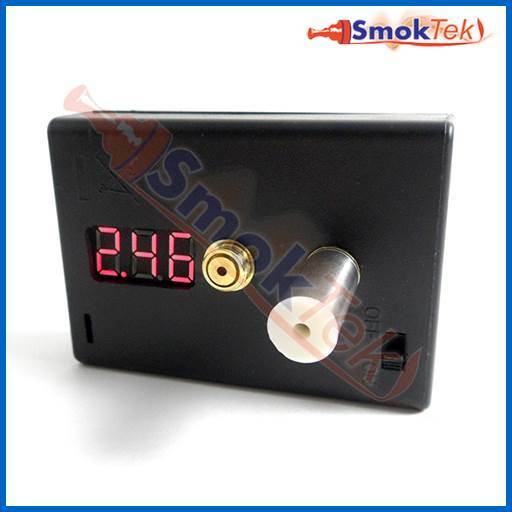 The ohm meter will read a "1" in the first digit to the left if there is no current flow through the device. It is simple and easy to use, with native 510 and 901/808 connectors. 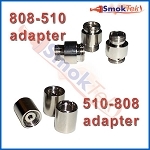 Extensions or adapters can also be used to test other atomizers, as well as eGo style atomizers/cartomizers/clearomizers. Requires 2 AA batteries, which are included. 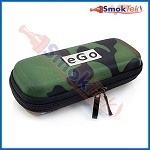 Also includes eGo-510 adapter. While yes we have a multimeter in the house, and yes I have a vague idea as to how to operate it, this is well worth the money for simplicities sake. It's nice and sturdy and as near as I can determine perfectly accurate. I primarily use this to check for shorts when i recoil my vivi nova heads. I managed to fry one battery before i wised up, so consider that if you're balking at the price. 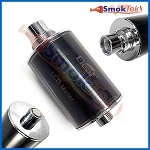 This device costs only about as much as a replacement battery would if you destroy it by having a short in a rebuildable. Don't know why. Maybe I got a faulty one. 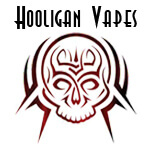 Tried 3 different tanks 3 different coils. Numbers jump all over the place. 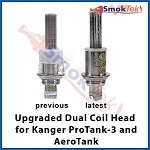 I know the coils I tested all all 1.8 ohm Authentic Verified Kangertech. Tried single and dual coils. Reading varies depending on how tight you screw the coil on and even slightly bumping the unit makes the reading jump up or down. Was worth the 5 bucks juat for the 510 to ego adapter it came with which is the main reason I ordered. Great seller though. Just not worth returning for 5 bucks. Everyone else seems not to have issues. Maybe I'm not using it correctly. 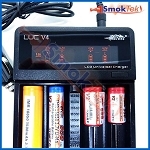 Have an Aspire inline volt/ohm/watt meter on the way here from these guys here at Smoktek. Looks cooler anyway. Probably have better luck with that. 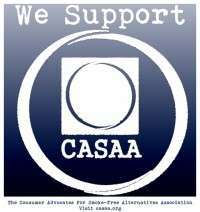 I purchased a basic reader from usaohmmeter.com for 3x the price and it was garbage. I ordered another reader from another site when I ordered this one... Turned out to be THE SAME ONE sold here for twice the price, and arrived a week after this. Thanks for the lightning delivery speed and legit prices. You obviously have the customer in mind. I recently purchased the ohm meter and have to say it is a godsend! 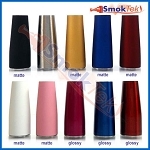 I am very happy with my purchase & highly recommend SmokTek. SO much easier than using a multimeter! Works great, simple to use. Only problem was a loose cover which I fixed with some tape. This is one of those why didn't I get it sooner things. 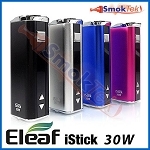 I have tossed so many carts away because I changed flavor or battery size and the forgot what Ohm they were. I would grab a used cart and put it on my current set up to see if they were good...and guess the size....how many times I figured they were bad when I put a 5 ohm on a 3.7 Volt device and it did not work, or fried a LR cort when I tried it on a 6 volt set up. 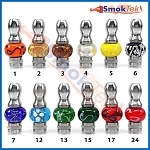 This is easy to use..lets me know what Ohm the carts are or if they are bad. Ohm meter does exactly what it's described to do. 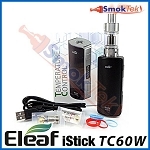 Works great and allows me to test the ohms in my carto's and rebuildables before sticking them on a battery. Great protection for your batteries to know if there's a problem before getting your battery involved. My battery has a protection feature on it so it won't short out if the atomizer is faulty but it's good to use for peace of mind. Great little ohm unit. Glad I got/have it. Great product. 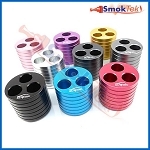 Easy to use, very good quality and the price. It is not the first order from this vendor, I like the customer service and the super fast shipping.Thanks!